We are thrilled to be able to offer you this awesome Factory specified superbike. All the bells and whistles you require for track and road. Quite simply........... SUPERB!! It looks good, sounds good and by golly it will do you good. 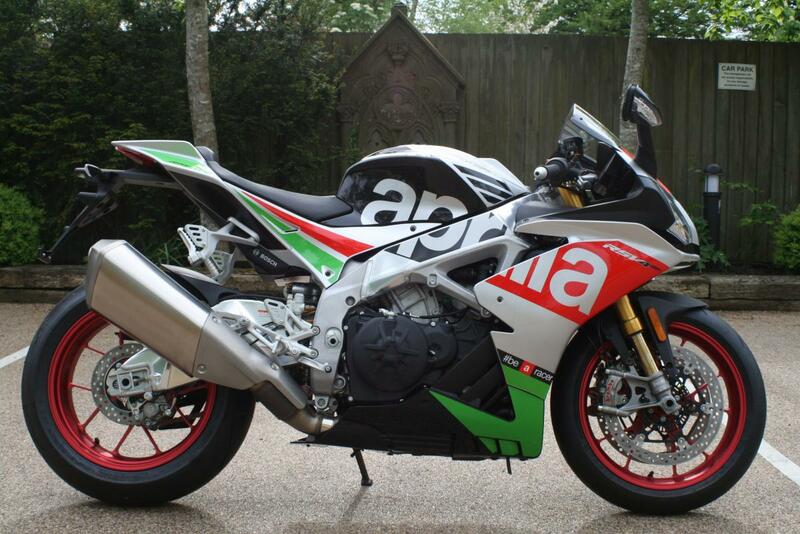 Aprilia's fantastic 999.6cc, V4 superbike. One owner from new, this bike boasts a full dealer service history and is offered in excellent condition. This RSV RF E4 meets all the dreaded Euro 4 emissions standards without adding weight or losing performance, The RSV4 also gets updated electronics and brakes and a few more tweaks to the engine. In terms of electronic rider aids, Aprilia Traction Control remains, but is now adjustable on the fly (without having to close the throttle) and has a new operating logic. Similarly, Aprilia Launch Control has new strategies, and Aprilia Wheelie Control can be adjusted on the fly using a new switch on the left clip-on, according to Aprilia’s press release. The RSV4’s quickshifter now has an auto-blip downshift function, plus it now comes with cruise control! !, Wecan offer very competitive low rates finance options against this bike. For a no obligation finance quote, please call 01747 811196 and choose option 1. Thanks for looking! !